According to a recent study conducted by the RAND Corporation, there are judicial costs of crime associated with every single charge that an individual is facing. As someone recently charged with a crime in Rockville, Maryland, whether it’s a first time DUI or a more advanced matter, you need the insight of an experienced Rockville criminal defense attorney. There are significant repercussions and costs that could be associated with a criminal conviction in Maryland. In fact, some individuals who do not take their charges seriously and attempt to represent themselves or work with a public defender may find that the outcome is not in their favor and that this continues to haunt them for years to come. In fact, some individuals who have served their sentences and attempted to move on with their life may feel as though the crime is continuing to haunt them for many years later. This is why it is strongly recommended that as soon as you are charged with any crime in Maryland that you consult with an experienced Maryland criminal defense attorney. It could make a tremendous difference on your ability to move on with your life and represent yourself to the fullest when any charges are faced. According to the RAND Corporation study, the judicial costs of crime can vary tremendously. A motor vehicle theft case, for example, might cost $400 to move through the court system. However, the costs of handling a homicide case can be as high as $44,000. 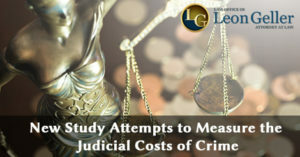 This is the first comprehensive study attempting to estimate the judicial costs of various reported crimes. Policy makers and members of the general public tend to think about judicial crime causes only being the thousands of dollars spent every single year to house one single prisoner. Unfortunately, legal services and judicial services get far less attention, depriving taxpayers of a clear picture of how major crimes have a bottom line dollar impact on society. This is also the first study that has attempted to measure these complex factors. In order to calculate the results, the RAND Project looked at national average costs of prosecuting and adjudicating 7 key types of crime. These results were reported in the Journal of Criminal Justice. The purpose of the study was to look at potential public savings if other options could be used to address allegations against criminals earlier on in the process. For example, hiring an experienced Rockville, Maryland criminal defense attorney can assist you in the event that you may be able to pursue alternatives. A criminal defense attorney brought into your case sooner rather than later gives you the best chance for this individual to explore options for having your charges reduced or dismissed. Alternative sentencing measures or pursuing negotiation options with prosecutors, for example, could lead to reduced charges for you and manage the matter more effectively and thus keep costs down. It can be extremely expensive to handle a criminal case in Maryland. You should never, however, underestimate the potential impact that this could have on your life. An experienced attorney is the only person who should be handling your criminal case. The consequences for your life could be significant and this is why it is strongly recommended that you consult with the right attorney immediately. Do not speak to police or sign or agree to anything without first talking to a knowledgeable Maryland criminal defense attorney. This could make a significant difference in the outcome of your case and also give you greater peace of mind about the potential outcomes. A committed attorney will explore all possible avenues for resolution and keep you informed for the duration of your case. When you are facing a complicated criminal defense matter in Maryland, even if it is a misdemeanor, you need the insight of a lawyer who cares deeply about your future.